All prices are per person for two people sharing a standard double room. Single supplements available upon application. Prices for holidays of different duration available on request. We are ultimately flexible. • Direct flights London to Athens. Business class prices available upon request. • Escorted transfers between Athens airport and the port. • First Class ship transfers to and from Amorgos. 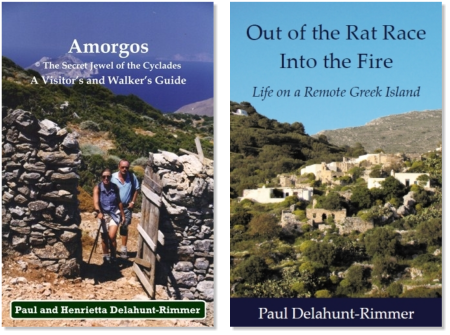 • Complimentary copy of our book: Amorgos - A Visitor's and Walker's Guide. • ‘Visitors Information’ brochure (by e-mail). • Transfer to the hotel on the island. • 8 or 15 nights, Bed and Breakfast (different periods available upon request). • Walk guides available every day on a pro rata basis. • Transfer from the hotel to the ship on departure. • Transfer from the ship in Athens to the airport. All prices are 'from' depending on flight costs. We consider this upgrade very well worth the small additional charge. All studios have a kitchenette area and private sea view balcony. Making a Holiday Enquiry places you under no obligation.